There's no question about it: when the weather turns hot, it's hard to stay cool in Memphis. With summer temperatures that tend to hover in the 90s and oppressive humidity levels, cooling off is a necessity. 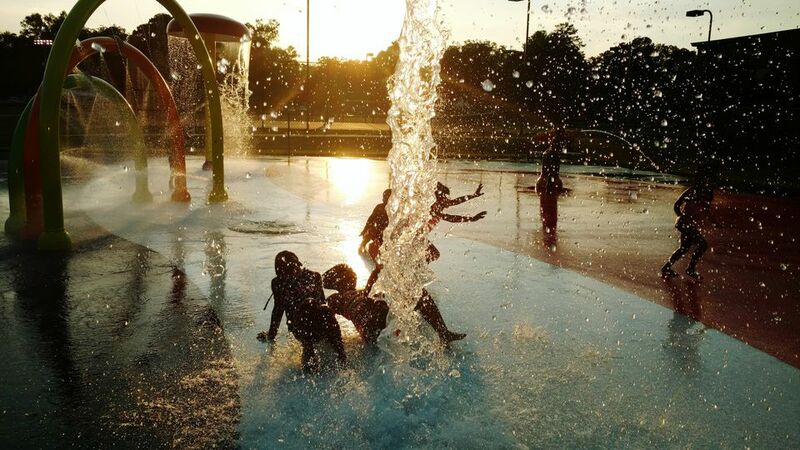 These splash parks, ground fountains, and wading pools are all great places to get some relief from the heat. Best of all, they are safe for children of all ages as there is little-to-no water depth involved. Located right in front of City Hall, the fountains at Civic Center Plaza are almost always on during warmer weather. Each in-ground jet sprays intermittently, providing endless fun for kids (and some adults) as they try to "catch" or avoid each spray. There are no colorful sprayers or water features but that doesn't seem to detract from the fun. There are two spray parks in Collierville--one at W.C. Johnson Park and the other at Suggs Park. These colorful parks are designed for children 12 and under and their parents. These parks are reserved for Collierville residents. In addition to thousands of animals, kiddie rides, a playground, and more, the Memphis Zoo also offers some water fun. Running through the zoo's Egyptian-themed courtyard is a replica of the Nile River that provides a few inches of wading fun. In addition, the Teton Trek exhibit features "geysers" (a.k.a ground fountains) that kids can run through. The Mud Island Riverwalk is a scale model of the lower Mississippi River. The bumps and contours are a little rough under bare feet, but the kids don't seem to mind. Best of all, the Riverwalk is part of Mud Island's free exhibits. If you can find a free place to park and walk across the pedestrian bridge, this can be a completely free visit. Currently, the splash pad at Peabody Park is the only one at a Memphis city park. It features sprayers and misters of different sizes to accommodate various age ranges. While the park can get busy on a summer Saturday, there usually isn't too much of a crowd. During the summer months, CMOM opens their colorful splash park for kids to enjoy. It's full of sprinklers, splashers, fountains, sprays, and more creative displays for the kids to enjoy. Near the "big catfish" at Beale Street Landing, there's also a riverside splash park for kids during warm months. There's a slide, fountains, and more, plus an amazing view of the river.